OK, I’ve been busy. I haven’t blogged in a long time. Life can be that way. I have a whole ton of stuff to tell you about, and first on the list is a whole series on my favorite tool, TabJolt. This post is going to get into how to do a basic install. It’ll document some of the mistakes people tend to make when working with TabJolt the first time. I’ve managed to make just about every mistake there is, so consider this post a fount of wisdom about what not to do. The second post will dive into more advanced uses of the tool such as metrics gathering and configuration settings. I’ll likely finish off with a post on interpreting TabJolt results and building your own vizzes based on what TabJolt spits out. To begin, I’m going to assume you’ve downloaded TabJolt from github and read the installation guide. You haven’t, you say? Well, go do it. Now. Kaifeng didn’t spend all that time writing the guide just for his health. …and that’s OK. There are lots of moving parts here and the chances of you doing everything perfectly the first time are low. You will see errors. No big whoop. Just work through the config process a step at a time, and TEST each step as you go to make sure it works so that it’s easier to spot where you made your error if you do happen to trip up. Rule #1: Don’t install and run TabJolt on the machine you’re going to be testing. 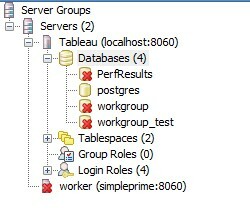 It needs to be on a different box and it will point to the Tableau Server you want to drive load against. Corollary #1: TabJolt config files generally point to localhost “out of the box”. If you don’t remember to point to your Tableau Server instead, you’ll have connection failures and/or will unwittingly collect performance data about your TabJolt machine, not your Tableau Server. Just like the fine manual says, you need to install Java. 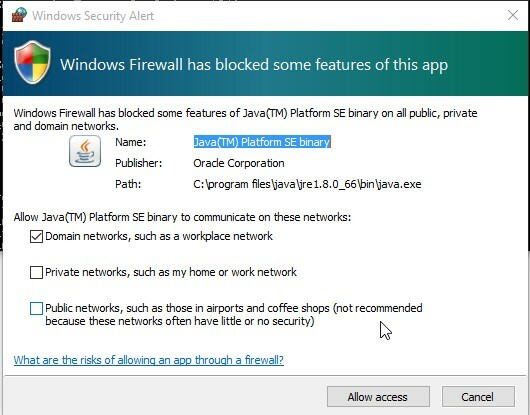 If you get a message: ‘java’ is not recognized as an internal or external command, operable program or batch file, it means you didn’t do what you were supposed to…OR that you have, but you’re still in a command window that was open before you installed Java. You’re going to want to do your work in a new, “post Java install” command window. After Java is installed, launch a new command window and check yourself. Breathe deeply and don’t just start clicking buttons! Seriously. I’ve been onsite with several clients who blasted through this dialog without really paying attention and we had a bear of a time getting TabJolt to run properly as a result. In one case, we gave up and just started with a clean machine because we couldn’t disable Windows Firewall altogether and couldn’t properly reconstruct the rules that were not created correctly when we had a chance to. 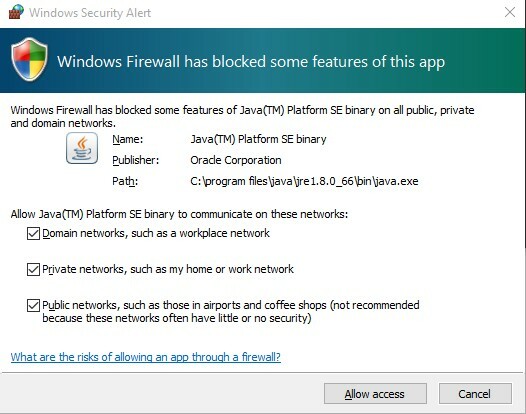 At a minimum, you need to allow Java to communicate on Domain and Private networks. I personally tend to enable all three network types since the TabJolt box I’m working with is often a “throw away machine” that was provisioned strictly for testing and will get blown away as soon as testing is complete. Lesson: If inbound rules for your firewall don’t get created properly, TabJolt is not going to work right. Don’t rush through the Firewall dialogs. The documents suggest that you install a new instance of Postgres to support TabJolt. This is the most simple and best thing to do, but isn’t always a viable option. For example, I run different instances of Tableau Server on different machines and sometimes install TabJolt on each one. I use TabJolt on Machine1 to test Machine2, and I use TabJolt on Machine2 to test Machine1. If you go this route, you’re going to want to use the copy of Postgres that got installed by Tableau Server itself to host your results database. This is possible, but you’ll need to do some Googling to figure out how to determine the admin username and password for your specific instance of “Tableau’s Postgres” …and then you’ll need to modify some of the base values in the config/PerfRunHarness.Properties file to match. Keep in mind that adding your own database to Tableau’s Postgres is not supported by Tableau and not recommended. Don’t do this on a production machine, ever. Here I’ve added the PerfResults database to my existing Postgres instance and changed the name of the owner to the admin/root user. You’ll need to change the hostUri value from http://localhost to the name of your Tableau Server (remember Corollary #1?) . Double-check your server name and be careful with your spaces. Note the space between hostUri and my server name below? It needs to stay there. If you inadvertently remove it, you’ll get the error below when you try to run TabJolt. In fact, just about any error that mentions getTestPassId probably has something to do with an incorrect or malformed entry in ServerTestConfig.yaml. Examine it carefully. A “bad” server (hostUri) name is frequently the cause of errors that come later. Vizpool.csv is the next file to touch, and you’ll want to include a pointer to a “known, good” viz. I’d recommend you start with a single viz – no more. BTW – the information provided on page 9 of the installation guide is quite complete, so just follow it and you should be in good shape. First, swing for the fences: For issue #1, set the forceLogin property of PerfTestConfig.yaml to true and see how things go. Even if you don’ t think you’re running into problem #1, just try it anyway. Humor me. Take the string from vizpool.csv and “complete” it: /views/WorldIndicators/GDPpercapita becomes http://myserver/views/WorldIndicators/GDPpercapita or /site/newsite/views/WorldIndicators/GDPpercapita becomes http://myserver/t/newsite/views/WorldIndicators/GDPpercapita. Paste this into the browser and see if it “works”. Does the viz exist? Are you prompted to login when you should see it “automatically” via the Guest account? Are you denied permissions to view the viz? FATAL [2015-11-22 10:35:02,714][setUp Thread Group 1-1] (LoadSessionSetup.java:57) – Failed to set up load test session. Stopping the test run. org.postgresql.util.PSQLException: Connection to localhost:5432 refused. 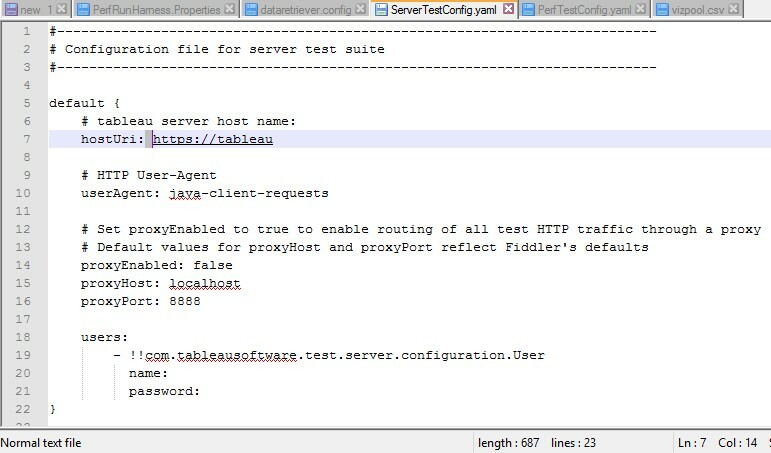 Check that the hostname and port are correct and that the postmaster is accepting TCP/IP connections. FATAL [2015-11-22 11:10:03,383][setUp Thread Group 1-1] (LoadSessionSetup.java:57) – Failed to set up load test session. Stopping the test run. FATAL [2015-11-22 14:00:01,936][setUp Thread Group 1-1] (ViewFetcher.java:332) – Please provide system administrator user name and password in ServerTestConfig.yaml. Tabjolt needs to log into the server to get all the sites and all the vizes in each site. FATAL [2015-11-22 14:00:01,937][setUp Thread Group 1-1] (LoadSessionSetup.java:57) – Failed to set up load test session. Stopping the test run. java.lang.IllegalArgumentException: Please provide system administrator user name and password in ServerTestConfig.yaml. Tabjolt needs to log into the server to get all the sites and all the vizes in each site. Keep in mind that we haven’t made any modifications in order to collect JMX or Perfmon Metrics from our Tableau Server — we’re only driving load. If you’re seeing errors related to JMX or Perfmon, hang on for the next entry which’ll get into all that fun stuff. Any idea what’s causing this? Hi , Please help to see log file seem it run but no Resp time, any suggestion to look on setup of tabjolt. ish processeing all Jmeter perf result samples. rent run in progress exceeded the maximum error thresholds. It will be stopped. s has exited. Waiting for the other processes to exit.